Storm started at 6 am and it continued till 9 am. With the heavy rainfall roads in Sukrabad, Malibagh, Greenroad, Dhanmondi, Rajabazar, Farmgate and some other lower lying areas were in under water as poor drainage facility. Office goers and school children suffered much for this heavy rainfall. 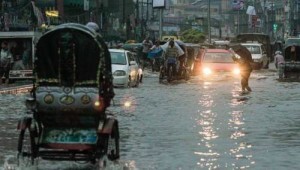 In many roads private cars cannot past through as roads became flooded. On the other hand rickshaws, auto rickshaws were not interested to take passengers.